Miss Jacoline Wentzel is without a doubt passionate about the Spa Industry, and is a respected industry representative and entrepreneur. Jacoline graduated with a Masters from the Stellenbosch Academy of Health and Skincare Therapy, and continued to excel obtaining her Masters from the South African Institute of Beauty Therapist (SAIBTH), Advanced Aesthetics from the British Confederation, her Masters from Cidesco (International institute of Beauty Therapists), Clinical Aromatherapy Masters from Eve Taylor Aromatherapy and her Aerobics/Fitness Instructor Diploma from the Exercise Teachers Association. It was during the period from 1996 to 2000, that Jacoline truly excelled when working for Steiner Transocean Ltd, when she became the Manager of a Health Spa on board one of the Cruise Liners. 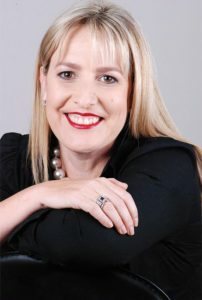 Jacoline later become a Steiner Recruitment Manager in South Africa as well as at head office in Lon-don, where she thrived allowing for her to being promoted to Regional Business Manager for Elemis Cosmetics Sales Division in United Kingdom. Jacoline returned to South Africa where she became the Bioharmony Sales Manager for Gauteng, from 2001 to 2003. In 2003 Jacoline was appointed National Sales and Marketing Manager for Nimue S.A. where her expertise and industry knowledge flourished. Jacoline left Nimue in the end of 2005 to open her own distribution and design company, The Spa Warehouse, which is solely devoted to the industry that she loves. Since 2005, Jacoline has been owner and in-house designer at The Spa Warehouse, a leading supplier of various prestigious spa brands, equipment and spa furniture.